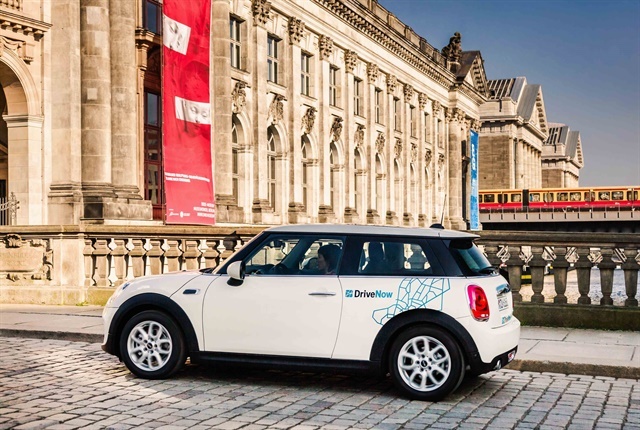 Photo of DriveNow service courtesy of BMW Group. Daimler AG and the BMW Group have combined their mobility business units with the intent of offering an app-based platform of connected mobility services. "The planned merger of our mobility services will pool our resources and sends a strong signal to our new competitors,” said Harald Krüger, chairman of BMW AG. The companies will offer carsharing, ride-hailing, parking, charging, and on-demand services. The joint venture will promote electromobility by offering electrified carsharing vehicles and "easy access to charging and parking options," according to a release. "There will be more people than ever before without a car who will still want to be extremely mobile," said Dieter Zetsche, chairman of Daimler AG and head of Mercedes-Benz Cars. "We want to combine our expertise and experience to develop a unique, sustainable ecosystem for urban mobility." The companies will offer carsharing through Car2Go and Drive Now, which operate 20,000 vehicles in 31 cities around the globe. The venture ties together ride-hailing services such as Mytaxi, Chauffeur Prive, Clever Taxi, and Beat that serve 13 million customers and 140,000 drivers. Parking services via ParkNow and Parkmobile Group will offer help finding, reserving and paying for off-street garage parking. On-demand mobility with Moovel and ReachNow will offer booking and payment services. Electrified-vehicle charging via ChargeNow and Digital Charging Solutions will offer access to more than 143,000 charging points around the world.